This building has a complex history, and is quite a remarkable survivor even in its current heavily modified form. 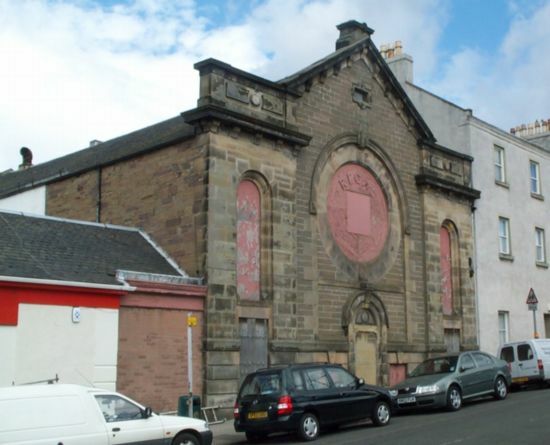 Originally opened around 1870 as a hall for the First Forfarshire Artillery Volunteers, the entrance was through a symmetrical sandstone gable on Church Street, the most striking feature of which was a large circular window in the centre above the door. The interior at this point was a fairly narrow, tall space, but well decorated, with plain pilasters on the side walls being topped by elaborate gilt Corinthian capitals and lion head bosses. Decorated beams in the ceiling ran from above each pilaster to the matching pilaster opposite, and a foliate cornice and rectangular inlaid panels provided a diagonal transition between wall and ceiling in between the pilasters. 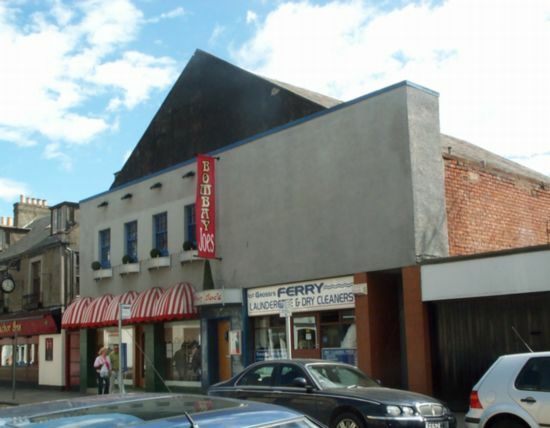 In 1936, the hall was adapted for cinema use as the Regal, by the Arbroath Cinema Company, with capacity for 712 patrons. This involved the creation of a new entrance foyer at the side of the building, on the much more prominent thoroughfare of Queen Street. The main hall was altered to create a balcony and stage with proscenium, but keeping much of the original decoration intact. New fittings and panels were used where necessary, and two sets of pilasters were partially removed to allow the fitting of the balcony. A new projection box was also added high up onto the rear elevation of the building. The original entrance end of the hall was blocked at this time for the creation of the stage and proscenium, with the circular window curiously replaced by concentric wooden slats and a name sign sometime after this. capacities, makes for a fascinating comparison. Of particular interest are the identical two-lamp light fightings, with the White Star logo on each stem, and the diagonal square coffering of the Rex ceiling and the Regal balcony underside. Bingo was introduced at the Regal on a part-time basis in 1978, later becoming full-time before the building closed in 1991.
still in situ. The aforementioned two-lamp light fittings from the Homeric adorn the side walls, with many even still retaining their cloth shades, as do the elaborate three-lamp fittings, which are mounted with golden vertical tridents as backing plates - again, presumably salvaged from the ship. The proscenium has gilt fruit and ribbon motifs to either side, and musical instruments above, while larger deco lights still hang from the roof. Some seating survives in the balcony, and even the stalls rake is intact, despite having to hold cars rather than patrons these days! Sadly, the 1936 foyer of the Regal was demolished to allow this new use. The patterned foyer floor was not saved, but some of the Homeric's mahogany panels which lined it appear to survive in storage on-site, albeit under several layers of paint. The building was B-listed in 1990, and is open daily for perusal of the cars inside - surely the most interesting and unusual car showroom in Scotland today? A full gallery of interior pictures from the Regal can be found here. o. c. 1918 by A Greig. s. 500. 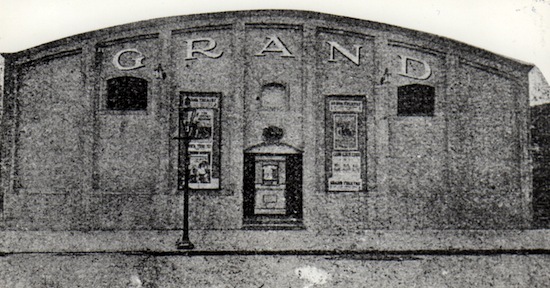 Sold to Arbroath Cinema Co, c.1930. Renamed, 1952. Cl. c. 1962. Now restaurants and launderette. An archive view of the exterior from an old postcard can be seen here. o. c. 1917 by P. Chambers. Cl. early 40s. Dem 1965; council housing.